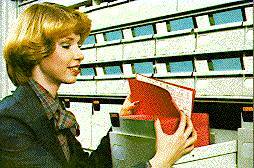 A Division of Penn Record Systems Inc.
have thousands of decision makers chosen Kardex Lektriever units for their storage and retrieval applications? Because the Lektriever units Save Valuable Floor Space and Revolve to bring the media to the user - eliminating or reducing non-essential operator movement: saving time, increasing productivity, reducing misfiles and errors. And, because Lektriever units pack the cube from floor to ceiling to provide more density of media in a smaller footprint, they reduce operator travel between storage units, and save Space! Lektriever units are easily interfaced with computers. 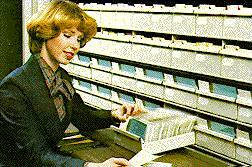 With computer control, the operator simply searches the database for the desired records and presses Enter. The Lektriever rotates to the first level, and a light flashes to show the position of the selected media. The process continues until all references, refiles are done! Lektriever® - Work Station convenience with full width work surface at sitting or standing height. Lektriever -- the Choice for Active Media! Lektriever Unit Interiors are designed to house all types of Media. These are just samples of the many uses for Lektriever units . . .
LEKTRIEVER Adds Media Capacity and Speeds Retrieval. 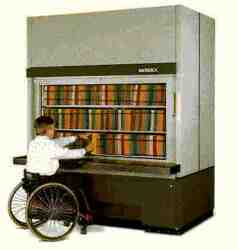 Kardex LEKTRIEVER brings file control into the computer age, with fingertip records access and unmatched use of floor space. LEKTRIEVER provides up to 1,938 lateral filing inches in just 34 square feet of floor space. Adjustable work counter allows files to be delivered at seated or standing height. Tray filing is available for a complete range of media sizes: letter and legal, all standard cards, oversize and hanging files. Only Kardex versatility allows the combination of different size trays that best satisfies any mixed media filing requirement. 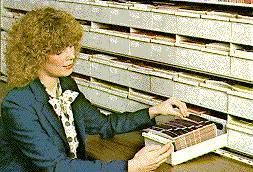 Kardex has designed trays specifically for storage and fast access to microforms, such as microfilm, rolls, cartridges, jackets, and microfiche. By touching the electronic keypad, requested media is quickly delivered to the operator. LEKTRIEVER houses more checks per square foot than any other system of its kind. It provides instant access to individual check-size trays, and improves operator productivity by reducing unnecessary motion. And the trays roll out smoothly on Delrin rollers for easy individual removal.